• To investigate the pathophysiology of nonpharmacologically induced panic attacks, 18 drug-free agoraphobic patients and 13 matched healthy subjects underwent structured exposure to phobic situations. Heart rate, blood pressure, and plasma free 3-methoxy-4-hydroxyphenylglycol (MHPG), cortisol, growth hormone, and prolactin levels were measured before, during, and after exposure. 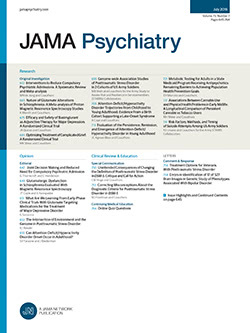 Fifteen patients experienced situational panic attacks during exposure. Panicking patients displayed significantly greater increases in heart rate but not blood pressure or plasma free MHPG or cortisol in comparison with the healthy subjects. Growth hormone and prolactin responses tended to be smaller in the patients. If brain noradrenergic hyperactivity occurs during situational panic attacks, it may be too brief or too restricted in regional localization to affect MHPG levels in plasma. Chronically recurrent attacks may cause an adaptation of neuroendocrine mechanisms activated by anxiety or stress.